Mathea Ford: So, how do you know as a person, individual since you’re a sleep expert. We all sleep, right? 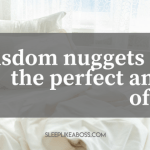 Everybody’s probably got an opinion but how do you know how much sleep you need? Just to start out with. Christine Hansen: It’s when you go to bed. And when you sleep well. The way that you know that you get enough sleep is that you wake up and you feel great. That’s a very simple way of knowing. Mathea Ford: So, if I wake up and I’m tired and groggy because I didn’t go to sleep till late and then in the morning I have to get up early to get my kids off to school. So, if that happens three or four days in a row I get more progressively tired but can I catch up on that sleep over the weekend? Is that such a thing? Christine Hansen: So the scenario that you described is a person collecting sleep debt basically which means that every day we don’t get enough sleep and that’s accumulating. And the good news is that you can catch up on your sleep debt within one night. And actually there was a guy in there I think it was probably the 80s or 90s who tried to set up the world records in the Guinness Book of Records of not sleeping and he didn’t sleep for a few days. I think it’s probably seven or eight and he started hallucinating having all kinds of issues. But the thing is he slept for a day afterwards like a little bit more than 24 hours and everything that had gone wrong in his body due to sleep deprivation was back to normal. So we can catch up very quickly on sleep in that sense. Mathea Ford: So, what are some signs that we’re sleep deprived? Because I know it when I mean if I’m staying up too late I’m getting up too early but maybe there’s more signs or more ways to know if it’s not that obvious. Christine Hansen: The thing is that a lot of people start to get used to being sleep deprived so they don’t really remember what it’s like not to be sleep deprived. So, things that we need to look out for is just our reaction time. Christine Hansen: A lot of times we suddenly noticed that we’re slower, slower in the way that we’re thinking, we are drifting off a lot more quickly and the difference is if when you’re not sleep deprived you notice that your mind is wandering pretty quickly but if you are sleep deprived your mind will wander off and it will actually take some time for you to realise that and put it back on track so you’re wasting a lot more time actually being sleep deprived. Other things are that while you will have obvious signs that your body will react in terms of the way that you look, you will age a lot more quickly, your skin is going to be a lot more it’s not going to be as healthy and then you have a cascade of reactions that are going to happen. So, you start to have you know your body is basically breaking down so you have digestive issues, concentration issues, your mood is obviously impacted, you will feel that you handle stress a lot less positively or you know just have a lot more trouble with that. Your patience obviously. So it’s really your body and your mind starting to act up. Mathea Ford:So, you mentioned that there are five pillars that you typically look out with relation to sleep and one of them is gut health. Mathea Ford: So, how does your gut health relate to your sleep? What sorts of things does that involve? Christine Hansen: So there’s different ways that the gut is connected to your sleep. So number one is that a lot of the clients that I work with have been under chronic stress so their cortisol has created damage in their intestinal lining. So, leaky gut is a huge issue that I encounter a lot. So suddenly you have molecules peeking through your gut into your immune system and it creates inflammation and a lot of that inflammation happens at night because the liver kicks in around 2 to 3 A.M. and a natural anti inflammatories are hormones like cortisol or adrenaline and those two are actually stimulating hormones. So, when you wake up at 2 a.m. which you most likely do because you know a sleep cycle is done and you should get into the next one. But if you have a full on inflammation going on it’s going to be tricky because you have stimulating hormones messing around. The other thing that happens that when your gut is weekend you tend to have opportunistic parasites and bacteria settling down and those create a lot of damage. They are also nocturnal so they will also be active at night time stimulating your body. So, that’s a huge issue and it’s my job to find out what is going on you know. Is there presence of parasites or bacteria? What is causing inflammation? Is it maybe food sensitivities that we need to look at? These are crucial crucial pieces that are just take detective work for me to find out what is going on. Christine Hansen: But it’s it’s a huge piece that everyone who is not healthy and doesn’t know why should look at. Mathea Ford: So, for something like bad bacteria setting up in your digestive system what do you typically work with people to get probiotics or what types of other things do people do to improve that? Christine Hansen: So I have a protocol that I set up with my clients. So, usually what I do if we suspect that there is something in the gut that is not supposed to be there I will start with something that’s called a biofilm disruptor and the biofilm is like a protective shield for parasites and bacteria and it’s basically first of all protecting them from medicine but also from being detected. And it’s also according to new research allowing them to communicate with each other. So, before I do anything I use a biofilm disruptor to basically disable that shield so that when we do testing to figure out what we are actually looking at it will be easier to pick them up. Plus, we will have weakened their defenses. So that’s what I start with. And then depending on what we find out that is there in testing I will use herbal protocols to clean up everything that’s in there. And the good thing about herbal protocols is that they are selective so they will get rid of parasites that are not supposed to be there but they will not be toxic for good bacteria for example. I always use probiotics especially Lactobacillus Rhamnosus GG which is a very specific strain that has been shown to be super efficient and beneficial for a lot of different conditions so I always recommend especially that strain and then it really depends. So, when we have parasites bacteria and yeast. I would first start with parasites, then bacteria and then yeast or fungi – always in that order. I would give some liver support because all of that is going to release some toxins. So, we want to support the liver to get rid of that if my client is showing detoxification symptoms I would use something that kind of binds all of those toxins together to reduce those and that’s how we would work. I would also look at nutrition of course. So, really reducing sugar during that time gluten usually. And it depends on every client. But I would really try to have a harmonic kind of work – working all the different pieces together. Mathea Ford: So that leads really well into my next question because you mentioned another one of your pillars w as nutrition and I know certain chemicals -caffeine – can affect your sleep but what types of things about nutrition truly are disruptive to sleep and then maybe even what things are helpful to sleep? Christine Hansen: Yeah absolutely! So, I really start with the basics. Really figuring out whether my clients have enough nutrients in their bodies so I would do a nutrient assessment to see whether they’re vitamins and minerals in good levels. Because all of that is affecting our health and the way that our body is working. And then as you said you know the first ones that we’re going to avoid is obviously caffeine and any stimulants like sugar but if we’re looking at sleep in particular there are a couple of things that I give a little bit more attention to. So, I’m going to share those with you and for anyone who’s listening. Christine Hansen: If you have insomnia if you’re working with people with insomnia those would be a couple of protocols that I would look into. So, number one is I always look at magnesium and magnesium levels. Magnesium is just a relaxant and it’s a muscle relaxant and it’s been really shown that there’s a big relation with sleep. So, that’s something that I look at. Also calcium and Vitamin B6, those have tranquilizing effects so those are some that I put priority to. Then, I also look at tryptophan which is a precursor to melatonin. It’s difficult to get all of those just via food you know for me nutrition it’s also supplementation. So, tryptophan I would really look at a supplement that has 5 HTP which is really grade to increase tryptophan and highly effective for insomnia. It’s also non-addictive. So, I actually prefer it to melatonin and then I would also look at eating seeds, nuts, roots, green leafy vegetables is great because they are high in calcium and m agnesium. Nightime Teas can help like he said include Camomile, Tilia flowers, Spearmint, Blueberry, BlackBerry leaves, Orange blossoms, Lemongrass, Hawthorn, Rosebuds or Rose Hips -those are things that I would include in my nutritional protocols and then during the day and basically for all meals I would really hugely advocate low glycemic foods. Foods that will slowly rise your blood sugar levels or basically release that sugar more slowly into your system so that you avoid having those spikes and crashes because you don’t want to have a blood sugar spike at night time just because your body is used to living in that zigzag pattern. So those are things that I would implement. Mathea Ford: With regards to hormones as well. What sort of hormones are going to be affecting our sleep and is there anything that nutrition helps with that? 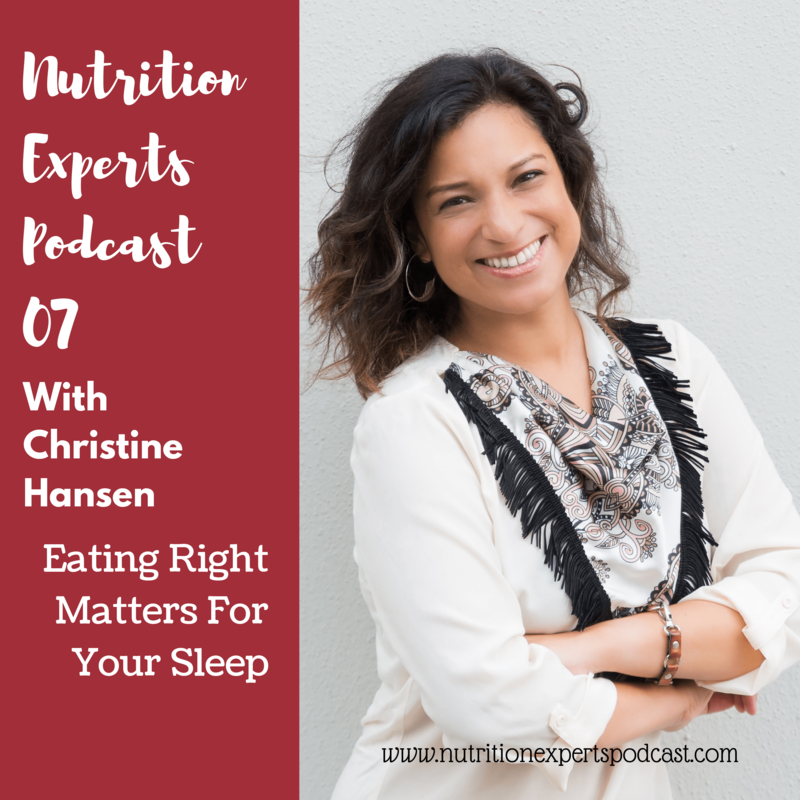 Christine Hansen: Well all our hormones are affecting our sleep. So, what I really notice is as soon as a hormone is out of balance it will affect your sleep most likely. So, whether that is your estrogens, whether that’s your testosterone, your progesterone doesn’t matter your cortisol you sleep will be affected pretty quickly also your thyroid hormone. So, nutrition wise everything that helps your body to relax is amazing so it’s really important for me to get a food sensitivity test done or to have an evaluation which I can also do with my clients without having to do the testing and avoid anything that stimulates that inflammation because that is going to put the body in high alert and contribute to having hormonal imbalance. So, that’s my first thing to focus on foods that do not have inflammatory capacity which is different for every kind. And then there’s different things that you can do – cumin or tumeric is an anti inflammatory for example – so I tried to have that in a lot of my clients’ diets. It has a musky taste. It’s beautiful yellow colour so I include that a lot. Again, blood sugar levels are super important so cinnamon is something that I include in a protocol for example or suggestion program that I do for my clients. Christine Hansen: Otherwise, sometimes it’s difficult just with food alone to really influence hormones too much but what it does is if you have a healthy diet which doesn’t include processed foods, doesn’t include artificial fats or doesn’t include too much sugar and is organic, it just basically going to reduce the stress load on the toxic stress load on your body so much that it’s going to start to relax and everything is going to start to get into balance as well so it’s an absolute necessary foundation as well that you need to have in place. Mathea Ford: Is there anything related to age that seems to be consistent? Like is there a point in our life where we tend to have more issues with sleep? Christine Hansen: I think for women definitely menopause you know when estrogen levels start to drop. It’s a huge huge impact on sleep. Night sweats keep women awake and things like that. So, definitely for men it can be as well. However, it’s also important to know that we don’t need less sleep just because we’re getting older. It’s a misconception that a lot of people have but a lot of the time what is happening is the older we get the less we often need to work because of retirement. And people start to nap too long and that is why a lot of older people have suddenly issues sleeping at night it’s because they have a lot of naps. And I think that plus a lot of people being suddenly indoors for a long time not getting the sunlight which is contributing to having a disregulated biological clock that can contribute to having issues of sleeping at night. But it doesn’t mean that we need less sleep. That’s actually not true if we just look at how everything changes on a homeowner basis, I would definitely say women in the perimenopause which can start with 40. Christine Hansen: It doesn’t mean that you need to be 55. You can really have symptoms pretty early but pre menopause and menopause is definitely two stages were in for women that will contribute to that. Yeah. Mathea Ford: Are there any chronic diseases or conditions that tend to cause issues with sleeping? Christine Hansen: A lot of them do. Definitely anything that’s autoimmune like thyroid, Hashimoto’s or Grave’s Disease. A lot of autoimmune conditions that have to do with pain. Unfortunately, it’s kind of the feedback loop you have the pain having people sleeping not as well. And then the sleep deprivation is increasing the notion of pain so very often you have Fibromyalgia, Lupus that can be very painful as well. So, those are definitely also impacted by sleep and vice versa unfortunately. Mathea Ford: I know exercise, being more active. 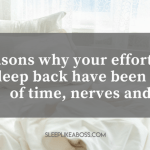 You kind of skimmed over it a little bit but I know that that’s been known to help people with sleeping just because you get that release of energy. How does exercise timing affect sleep? How does it go with around the time you know should you exercise late in the day? Should you avoid exercising late in the day? Should you always exercise in the morning? Is there any advice about that? Christine Hansen: Number one movement is absolutely beneficial and I’m on purpose saying movement because exercise depending on what kind of state my clients are in actually be stressful. So, if I have someone who has already a lot of health issues I would not recommend them going to the gym five times a week which is additionally stressing out their body. So, that’s I’m seeing movement and movement could be having a funky dance in your bedroom. It could mean getting off the bus stop a little bit earlier. It could mean parking your car further away from the supermarket. You know just moving in itself is undoubtedly amazing for sleep. Exercise can also be great first of all for your health but also for stress release as in timing it depends on your system. So, in general, exercise has been recommended because your temperature goes up and when it drops it can favor the sleep because a temperature drop in general is really connected with going to sleep. So, the philosophy is that you know when you favor or when you encourage a temperature drop it’s going to help you to drift into sleep which is true but for some people especially after cardio, their body has a hard time of regulating itself back to coolness and then they are lying there and they have a racing heart have a high pulse and sleep is even worse than before. So, for those I’d definitely not recommend doing exercise especially cardio in the evening. Yoga or something like that is absolutely okay. The other thing is that if you go to boot camp and you have an instructor screaming at you and glaring lights and light and super loud music and you know it’s super stimulating that’s not going to help your sleep either you know. So, for some people they’re going to be so exhausted that they’re just going to drop dead and it’s fine or drop this you know for sound asleep. But for people who are sensitive to these things it can just be overstimulating and sleep is a process. You know, you drifting into sleep. It’s not an on and off switch so going from super stimulating class like that straight to bed can sometimes be counterproductive. So, there’s different things to consider. Mathea Ford:] I have noticed that there are some habits that seem to lead to better sleep specifically putting my phone to the side 15 – 20 minutes before bed time and just relaxing by reading a book or talking to my husband. So, are there any specific groups of habits or anything that you recommend that if someone seems to have a little bit of trouble at times going to sleep what might improve that? Christine Hansen: Yes so bedtime routines are definitely helpful because they just train our brain right? It’s just like getting on autopilot and having a domino chain reaction. However, bedtime routines are highly individual because we just like different things. But my favorite that you have a timer that goes off an hour before you go to bed. And so an hour is a lot of time. You know you can get a lot done and it’s just preventing from that crazy wash that you have before you need to go to bed and you need to finish everything for the next day. So, set your timer for an hour before. I find that very very helpful. And then a couple of other things are to be tidy. That’s not what I used to be I can promise you the bedroom used to be the place where I lived in, worked in and everything but having a super tidy bedroom, very minimalistic, don’t have the chair with all the clothes on it. A plant in it, beautiful, simple, clean, empty, more less space is going to help you because it’s calming on the eyes. It’s calming on the mind. So that’s definitely something that I recommend. I also recommend doing your bed every morning because it’s just such a beautiful feeling when you come home and when you go to sleep so it’s just already connotation with something positive and then another technique that I love to use with my clients is that they have a beautiful notebook that they spend a little bit more money on and they write down three positive things before they go to bed and it simply helps you to not think about what happened during the day and finish that day on a positive note. So, that’s something that I always recommend as well. Then, of course leave the charger of your iPhone in the kitchen and leave your iPhone charging in the kitchen as well. You will be sleeping which means that you won’t be checking your iPhone. Christine Hansen: So, my clients are typically those who are sick and tired of hearing from their regular practitioner that everything’s okay you know. So, they know that something’s not right. They’re not sleeping. They usually have lots of other symptoms – digestive issues, hair loss, thyroid issues you name it. But when they go to a lot of regular practitioners they are just being told everything is okay. Everything is fine. And that’s when they just know it’s not true. So that’s when they come to me. Then when we look at the holistic kind of the the big picture and how everything is connected that’s when they get motivated because you know even though we often find that a lot is wrong with them when we do our testing, it’s great news because finally we have something that we can work on instead of just being told everything’s okay, well then nothing’s going to change. But when we actually see, “Look there’s things that are not okay we have to balance your hormones. We should look at your gut. We have to clean that up and coach sat back to health.” That’s when a beautiful journey starts. And anyone who knows that they’re not okay but they just haven’t found that person yet who is listening to them and who’s believing in them. Those other people that are my dream clients.